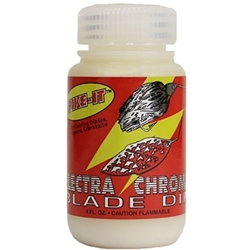 Blade Dip is a lacquer based dip made with transparent dyes which will give your blades, hooks, plugs or spinnerbaits that "candy color" look. It has a glass clear sheen that will enhance, not hide the original finish. White is the only exception and is slightly opaque. Blade Dip is packaged in a 4-ounce, wide mouth bottle making it easy to dip your spinnerbaits and crankbaits. | 4 fl. oz.